Bodiography Contemporary Ballet's new show heralds big changes. Maria Caruso founded Bodiography Contemporary Ballet on the premise that a "ballet body" can take many forms beyond the stereotypical toothpick physique. The company was about changing people's perspectives on ballet and those who dance it. Some seven years later, the message remains the same. But Caruso feels that the way she and her company deliver it is itself in need of renovation. Thus, the two new works of Caruso's featured in Bodiography's Innovation 2007, Feb. 3 at the Byham Theater, herald a marked departure in her choreographic approach. Moreover, Innovations will mark Caruso's last local performance as a full-time dancer with the company. The 26-year-old Caruso wears many hats for Bodiography: artistic director, choreographer, costume designer and marketing director. But it is her role as principal dancer she now feels she must give up. Caruso won't disappear completely from performance, she says. But her dancing in future productions will be limited. "I have always been a juggler," says Caruso, "able to balance dancing and many other jobs within the company. But I feel the only way for the company to move forward is for me to really invest in my abilities as a choreographer and focus more on my duties as artistic director." Caruso feels that over the past few years, her dance works had become formulaic -- ballet movement coupled with an emotionally charged storyline. For her new, 40-minute ballet "Kaleidoscope," Caruso chose concept over story. 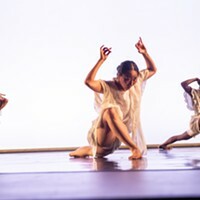 Set to music from The Dave Matthews Band's hit 1994 album Under the Table and Dreaming, the piece showcases 16 dancers (including upper-level students from Bodiography's school) in a work based on pattern, shape and color. It's all to create what Caruso calls a "body landscape." "I closed my eyes listening to Matthew's music and saw bursts of color," says Caruso. "I wanted to convey those images on stage." Divided into eight sections, the ballet changes its look as it progresses, moving from a neutral color palette through a kaleidoscope of color reflected in the dancer's costumes that Caruso describes as "insanely bright." Caruso's second work on the Feb. 3 program, "Mentality Toiled Empathy," is a 14-minute duet for company dancers Lauren Suflita and Shannon Hritz. Set to music from the 2005 film Shopgirl, by Australian composer Barrington Pheloung, it examines the volatile relationship between heart and mind. 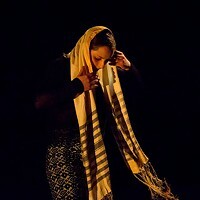 Caruso says that here, again, she broke away from her norm, by using modern-dance movement more than ballet technique to portray a sense of conflict and coexistence. The final work on the program is Anjali Austin's "Attaining Wonder." Austin is a former dancer with Dance Theatre of Harlem and was a mentor of Caruso's at Florida State University whom Caruso asked to help celebrate her career transition and the company's fifth season at the Byham. Speaking by phone from Atlanta, Austin described "Attaining Wonder" as fast footwork en pointe danced in a mixture of styles from ballet and jazz to West African. The 20-minute group work in three sections is set to a variety of music, by composers including Senegal's Pleb. The title comes from the writings of philosopher Alan Watts. "What interests me is how the individual dancers capture the movement and moment of the work and make it their own so the audience has a shared experience with them as opposed to being simply spectators," says Austin. The program will also include exhibit of visual art by local artist Eric Rose, featuring photography and sculpture of Bodiography's company dancers.